Many schools and libraries identify Willow Award Finalist books in their collections by placing a Willow sticker on the spine or front cover of the books. 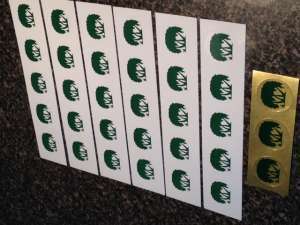 We can provide stickers for the finalists and special stickers for the winners. Finalist stickers are circles, 1 inch in diameter. 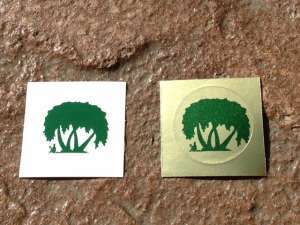 The green graphic on white, shown below, is for finalist books; a similar sticker with the green graphic on gold foil background is for winning books. Your purchase of stickers helps to raise the visibility of The Willow Awards and highlight great literature. Some schools and libraries have found it helpful to place a willow label with the year identified close to the circulation barcode on the book. This makes it easy to identify which books are the current year’s willow finalists at check-in time so that they can be returned to a special Willow display area or reserved for children reading the current year’s Willows.